Hey folks, this is a long overdue update to our Megami Tensei translation making it hopefully complete and issue free. The ending music does end prematurely due to the extend length of the text, so if anyone would be interested in helping us with that, we would welcome it. In addition to bug fixes and script changes, an additional hack was done to swap the sprite of Purski with the Behemoth sprite. This was done because it appears the original devs made an error as Purski is supposed to be one of those Hindu elephants and it was finally corrected with SMT. So we've changed it accordingly. Please note that this game didn't play nice for us when using savestates, especially in the middle of battle. Nice - a bit of a shame that the 1emon issue is still shrouded in mystery. I couldn't replicate it consistently. Either way, nice to see this wrap-up. Excellent news! I wasn't patient enough to wait for this update, I played through the game with the original patch, and did indeed encounter a bunch of frustrating errors along the way. Glad to hear that future players can avoid that! I forgot to mention there's a nice English manual and other stuff included with the archive. So I'm glad this is available and everything; I don't want to take anything away from it. But a serious question, offered in good faith: is there any point apart from historical value in playing this over the SFC remake? I hope people give it a try. At the start, open the chest on the first floor, but DON'T SPEND YOUR MAKKA OR LEAVE THE FLOOR. Have Yumiko cast the map spell, then heal her for 2 makka. Go back to the chest. It magically refills! It only does this once, though... But that should let you buy good enough equipment, so you don't get creamed at the start of the game. Different maps and (IMO) better soundtrack/enemy designs in the FC version. There are some other differences of course, both for better and worse. I personally like DDM 1 for the FC and DDM 2 for the SFC the most, as far as versions go. I'm still holding out hope that there might be a translation of the Famicom version of DDS2 one day. Supposedly it's got some pretty sweet 8-bit music. I always did like the music and the enemy designs were pretty cool. Didn't care for the repeated encounters, but whatever. Some people still like playing NES games and I'm sure they'll enjoy it. It's on the list and not high on my priorities, despite Tom's enthusiasm. Maybe there'll be some rumblings when I continue to finish my backlog of in-progress translations. The SFC version's difficulty was also reduced, from the little I played of the remake. Enemies in the first area would go down pretty easily, whereas the original's enemies seem to take a few hits. Personally, I like the Famicom originals because of their unique sound and style. I feel the remake looked too much like Shin Megami Tensei. It lacks its own distinctive vibe. 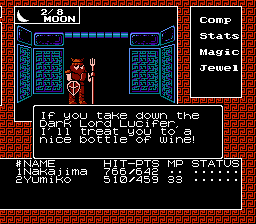 MT 2 on the Famicom is my all-time favorite entry in the entire Megaten series. 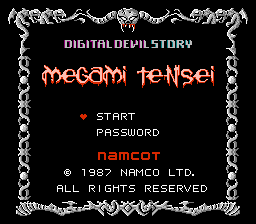 The only reason I did Megami Tensei 1 first was because I wanted a proper set-up for 2. Of course, the remake is available now, so it seems less pressing to work on it... But I still want to do it eventually, if only for a handful of people. I will get around to it eventually, at some point after Zill O'll. I'm glad to see this update! 0.99 patch was buggy, freezes in battles. As one of the handful, I'm happy to hear it! I did not finish playing the game in Japanese due to the chained-encounters making you fight overwhelming numbers of enemies. (what I mean is that when you beat one enemy party, another instantly spawns, and you only get money and EXP for winning ALL encounters) It happens sometimes in early dungeons but becomes pretty much every battle by about the third region. I got annoyed at it enough to dig and figure what ROM address to change to make all battles only one encounter. Perhaps it was to balance the scarcity of encounters (encounters seemed to rarely happen outside of walking through doors) but I'd rather have more encounters with small groups than a low encounter rate with huge mobs. Also, finding the fourth boss seemed kind of ridiculous, though it's very possible my poor Japanese skills made me miss a hint that would've let me find it without an FAQ. So you're supposed to use Mapper in a suspicious room after putting away all your minions before entering the floor, or something like that, to unlock a secret door. I wondered why the dungeon seemed insanely long but it seems I had actually wandered into the fifth dungeon (Hell? ) before beating the prior boss. How is it even possible for a game to not work using savestates. short of the savestate feature not actually saving the state 100% properly? (which would depend on the emulator.) Is there some particular emulator on which the savestates won't work? Because I do all my hacking on FCEUX, that's what it was tested on. I'm guessing savestates in FCEUX screw with the internal coding somehow, like those people who do that series of moves in Super Mario World that reprogram it to show the ending. Basically, they can create a hiccup in the game that may spill out into a glitch. Really should try playing it using another emulator to see if it doesn't glitch there with savestates. Note that savestates don't guarantee a glitch. They just seem to put another round in the chamber for a game of Russian Rom Glitch Roulette.